It's no secret that I love taking the children foraging. It's a perfect excuse to show children how the seasons change through their environment. Helena is particularly fascinated by the fact that simply by walking a few metres along a woodland footpath you can collect enough wild edibles to create a three course meal - honestly! 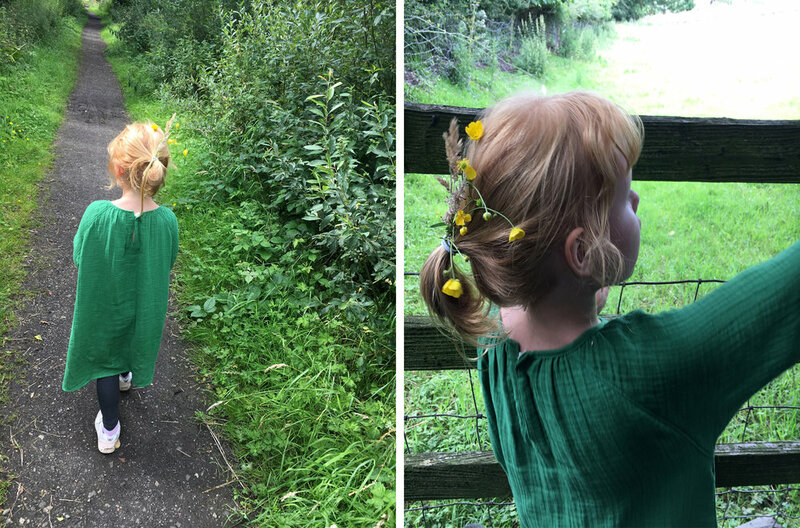 During the summer holidays (which seem so far away now) we went on loads of family walks through the fields behind my parents home. Filled with mallow, nettles and even the odd sighting of mushrooms (!) because after all these seasons of ours are so confused, we collected loads of delicious pickings. Although nettles are best picked in spring they are still great to add some depth in baking. We managed to find a batch wild on the side of the footpath and quickly popped back to the house to grab some thick gloves and picked a little bouquet of them to add to our Sunday scones. Nasturtiums are so easy to grow from seed and are in abundance now (if sown early on in summer). They are a perfect edible flower for children to grow as they are so resilient of all kinds of weather and they spread really quickly once they start flowering. Their pretty flowers come in all shades of yellows, reds and oranges and really bring a happy glow to the garden. The leaves are as tasty as the flower petals and are so pretty scattered on autumnal salads. One of our new favourite recipes we've been making in small batches is nasturtium butter. This is such a pretty addition to an afternoon tea. It's so good my mum is entering it into the village show very soon! 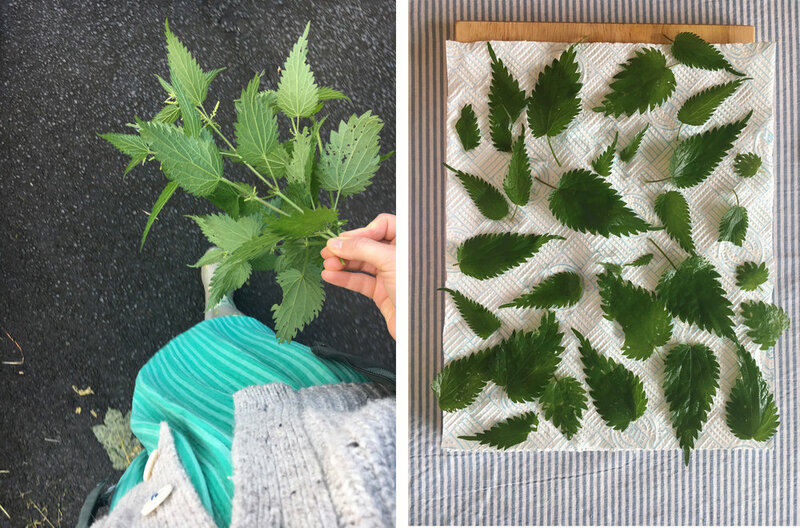 Wearing thick gloves, pick the nettle petals from the stem, wash really well and dry on a piece of kitchen roll. Next up, take the sting out of the nettle! To do this (using tongs) add the nettles to a non-stick frying pan with no oil and wilt them on a medium heat for around ten minutes turning occasionally. Be careful not to burn the nettles, you want them to wilt but not change colour. Pre-heat the oven to 220 degree C (fan 180 degree C). Place the flour in a large mixing bowl and add the butter. Using your hands hide the butter into the flour by rubbing both ingredients together. Carefully add the chopped nettles and mix. Next add the mustard powder and salt and mix adding the cheese gradually. Make a well in the middle of the mixture and pour in the milk. Using a blunt knife, mix until you have a soft dough. On a floured surface carefully press out the dough with your hands to a 2 cm thickness and cut into rounds. We used a cutter size of 6cm. Brush the tops with milk and sprinkle a little grated cheese on top. Bake for 10-15 minutes until the tops turn a golden brown and the cheese is melted. This is such a simple recipe; so quick and easy. It was really delicious with these nettle scones and goes equally well with a lovely cheese scone too. Chop the nasturtium petals and the leaves and mix well with the butter and salt. Chill until it's firm and serve with warm scones. The butter will last for around 2 days but it's also fine to pop into the freezer.